For Mika Brzezinski and Joe Scarborough, Thanksgiving was full of not only turkey and pie but secret plans and wedding bells. Brzezinski and Scarborough married Saturday evening at the National Archives in Washington, D.C., in a small and private ceremony. “Morning Joe” co-host Willie Geist – who couldn’t attend due to work commitments – announced the news of the nuptials on Monday’s show. Geist also revealed that Rep. Elijah Cummings officiated the ceremony, which took place in front of the Constitution and the Declaration of Independence. Their children greeted them after the ceremony and about 40 people attended the post-wedding reception at French bistro Chez Billy Sud, according to Vanity Fair’s Emily Jane Fox, who broke the news. The couple made a few phone calls rather than send formal invitations. The wedding was shrouded in secrecy: Most of the people working for the vendors didn’t know the identity of the couple celebrating and none of the guests knew where the reception dinner was until Saturday evening. 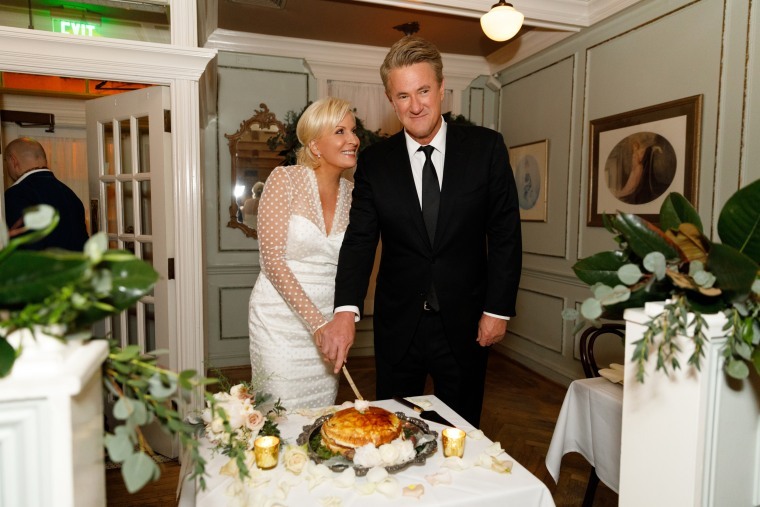 Saturday’s party ended with the cutting of a 20-layer crepe cake, and then the newlyweds were off for a five-day honeymoon before Brzezinski holds her annual Know Your Value national conference in San Francisco on December 1. This new chapter for Brzezinski and Scarborough began in May 2017, when the pair were engaged during a vacation at the Hotel du Cap in Antibes, France. On the last day of their trip, Scarborough proposed as they walked to the hotel lobby overlooking the Mediterranean.